David Bowen (°1975) is a studio artist and educator who creates kinetic, robotic and interactive sculptural works. Bowen’s work is concerned with aesthetics that result from reactive and generative processes as they relate to the intersections between natural and mechanical systems. 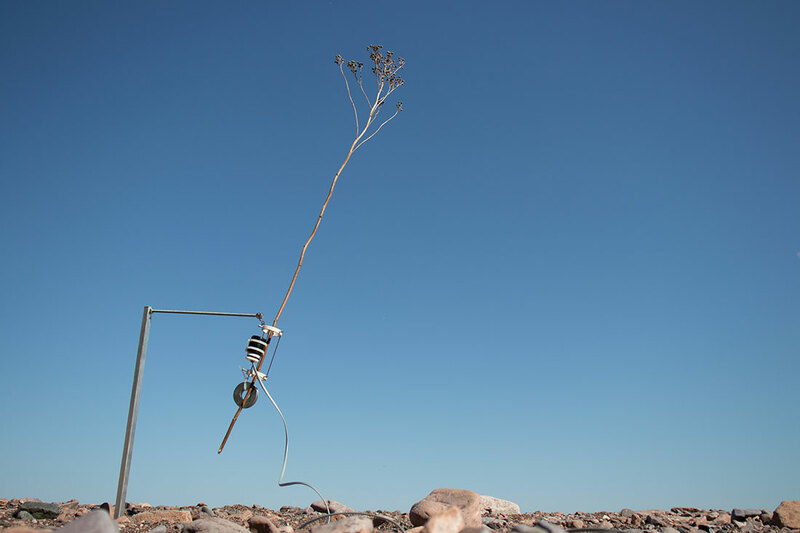 Tele-present wind by David Bowen consists of a series of 126 x/y tilting mechanical devices connected to thin dried plant stalks installed in a gallery and a dried plant stalk connected to an accelerometer installed outdoors. When the wind blows, it causes the stalk outside to sway. The accelerometer detects this movement transmitting the motion to the grouping of devices in the gallery. Therefore,the stalks in the gallery space move in real-time and in unison based on the movement of the wind outside.